When it comes to Vietnamese-style rolls like this one, filled with lobster meat, cucumber and fresh herbs, a few questions tend to arise. Q. Is it spring roll or summer roll? A. Call it either one. 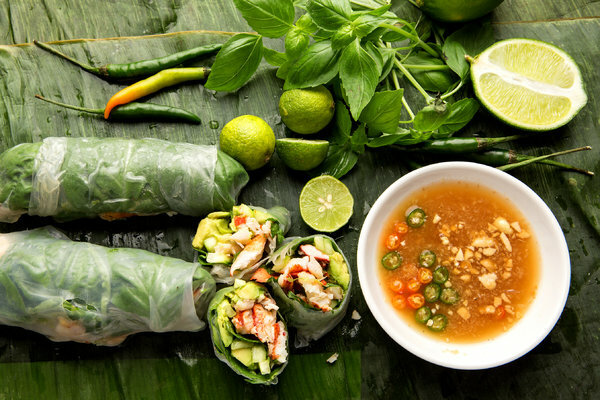 (We’re talking here about fresh salad rolls you find in Vietnam, which usually contain a few cooked prawns, along with herbs and rice vermicelli.) But since it’s summer, and since these salad rolls are ideal summer fare, I’m going to stick with summer roll. Q. But aren’t spring rolls fried? A. Not necessarily. The fried ones go by many names: imperial rolls, egg rolls, nems. But they are also, confusingly, sometimes called spring rolls. Q. Aren’t they hard to make? A. They are not at all hard to make, with a bit of practice. Still, unless you grew up assembling them, there is a learning curve, and dexterity is required. Now then, about these not-quite-authentic-but-awfully-delicious summer rolls. They make a fine lunch, wrapped in a lettuce leaf and dipped in a gingery, lime, hot peppery sauce. Cut small, they can be served with drinks, or they could be an elegant first course at a sit-down dinner. To prepare a summer roll, first moisten dry rice-paper wrappers (most Asian markets sell them) in a bowl of warm water. It will take only 30 seconds or so to soften each sheet of rice paper, at which point you must grasp the wrapper in both hands and lay it flat on a cutting board. Though they come in all sizes, a 12-inch wrapper is easiest to use; otherwise use two 8-inch wrappers per roll, overlapping them somewhat on the board. The filling needs to be placed at the bottom third of the rice paper circle. I like to start with fresh herbs, especially basil leaves and cilantro, then I add other elements — here, just-cooked lobster meat, cucumber and avocado. Next, the sides of the circle are folded in and then the rolling begins, from the bottom. It’s important to wrap the filling as tightly as possible for a firm roll, which makes it both easier to cut into pieces and easier to eat. You’ll feel a tinge of pride when you master the technique. But if by chance, despite your best efforts, your lobster rolls become unruly and fall apart, no need for despair. Just plop the perfectly good remains on a plate, drizzle with the dipping sauce and call it a rice noodle salad.